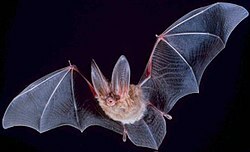 Traditionally, bats are divided into Microbats, which use echo-location and catch insects, and Megabats, which do not echolocate, but instead eat fruit or nectar. The phylogenetic relationships of the different groups of bats have been the subject of much debate. The traditional subdivision between Megachiroptera and Microchiroptera reflects the view that these groups of bats have evolved independently of each other for a long time, from a common ancestor which was already capable of flight. The hypothesis was that flight only evolved once in mammals. Most molecular biological evidence supports the view that bats form a single or monophyletic group. All Eocene bats had long tails. This feature is also found in early flying insects in the Carboniferous, in early pterosaurs and in Archaeopteryx and other dinobirds. The tail helped to keep their flight stable, which means it kept on course, and did not dart about much. To dart about quickly requires special advanced brains and reflexes, which later bats, birds and pterosaurs had, but early ones did not. It requires more brains to control unstable flight than it does for stable flight. The Fisherman bat Lives in Latin America and the Caribbean. It swoops low over water and grabs small fish with its claws. Wikispecies has information on: Chiroptera. ↑ Eick G.N. et al; Jacobs, DS; Matthee, CA (2005). "A nuclear DNA phylogenetic perspective on the evolution of echolocation and historical biogeography of extant bats (Chiroptera)". Molecular Biology and Evolution 22 (9): 1869. doi:10.1093/molbev/msi180 . PMID 15930153 . "Several molecular studies have shown that Chiroptera belong to the Laurasiatheria and are only distantly related to dermopterans, scandentians, and primates". ↑ Tudge, Colin (2000). The variety of life. Oxford University Press. ISBN 0-19-860426-2 . ↑ Just a few eat fish or drink blood. ↑ Eiting T.P. and G.F. Gunnell. 2009. Global completeness of the bat fossil record. Journal of Mammalian Evolution 16:151-173. ↑ In old-fashioned terms, a mixture of primitive and advanced features. ↑ /kaɪˈrɒptərə/; from the Greek χείρ - cheir, "hand"
↑ "Bumblebee bat (Craseonycteris thonglongyai)". EDGE Species. http://www.edgeofexistence.org/mammals/species_info.php?id=49. Retrieved 2008-04-10. This page was last changed on 3 December 2014, at 05:19.